Very look like lazurite, lapis lazuli is mineral Sodalite (on a photo on the right). A mineral is adopted Sodalite, because sodium is included in his composition (greek a "soda" is sodium, "lithos" - stone). A mineral also is aluminum silicate of sodium and be found more widely. His chemical composition: oxide of sodium (Na2O) 25,5%, oxide of aluminium (Al2O3) 31,7%, silex (SiO2) 37,1%, chlorine (Cl) 7,3% and formula of Na8Ca2(AlSiO4) 6CI2, or 3Na2О·ЗА2О3·6SiO2·2NaCl. Indeed, from the chemical point of view of Sodalite is chlorine-containing aluminum silicate of sodium. A color of Sodalite can be different. It depends on admixtures and varies from dark blue and greenish to red. There are white, grey and colourless standards. There are semilucent Sodalite. Their colouring varies from whitish and rather yellow to greenish and blue. Quite often on-the-spot stone the white veins of calcite are visible. Blue opaque Sodalite it is possible to entangle with азуритом and lazurite, lapis lazuli. Sodality usually meet as grainy the masses, transparent crystals meet rarely. Form of crystals: rhombidodecahedron. 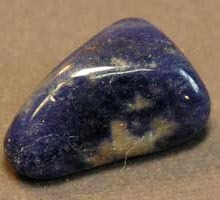 Sodalite very often give out for lazurite, lapis lazuli (both on intention and on ignorance), because it is cheaper. In beads and other inexpensive decorations slightly translucent Sodalite be found much more frequent than lazurite, lapis lazuli. Unlike lazurite, lapis lazuli, mineral Sodalite does not contain ions grey and be found as an array of accrete crystals. 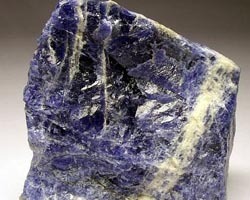 Alomit is the point-of-sale name of Sodalite of blue color. Sodalite has more glass brilliance and can a few to transparent as compared to lazurite, lapis lazuli (lazurite, lapis lazuli does not transparent in general). Lazurite, Lapis lazuli often associates with a brazil pyrite (inclusion of goldish color), and it is not Sodalite (contain mineral zircon, mariupolite). If there are doubts, there is mineral Sodalite or lazurite, lapis lazuli, it is better to consult by an independent specialist, because lazurite, lapis lazuli is valued higher and often stands dearer Sodalite. Sodalite - good stone for meditations, as he helps a people inwardly concentrated. It is considered that Sodalite is instrumental in a fight against fears and helps achievement of internal harmony. 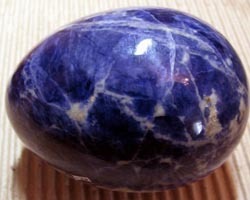 Sodalite - one of stone of the "third eye". It clears a mind, influences it on internal sight and receipt of intuitional knowledges. Sodalite is useful all, who wants to drive the ideas and senses to the order.